Broysan Planus Macerator Problems London Help FAQ Need repairs on site in the London or Herfordshire Approved Engineers fast repairs read our reviews. Are you In London or Hertfordshire call: 07958758840 For on site approved repairs or servicing. Email us if you need help with a problem that is not listed. Below we have provided a list of real common problems with a solution to those problems. These are based on the work that we do every day from real experiences. As we are experts in the diagnosis and the repair of Broysan Planus Macerators this is the best place for real help, avoid taking advice from forums if possible unless the person offering advice actually fixes Broysan Planus Macerator pumps all day long like we do. If you found our information please share or link to us. We can repair your Broysan Planus Macerator problems In 1-2 Hours. A Broysan Planus Macerator will give you years of good service if used correctly and not misused in any way. We have read many forums over the years and some users will say, dont buy a Broysan Planus Macerator there unreliable, they dont work properly, there a lot of hassle, they get blocked etc. They are none of these things, they are good well made quality macerators and top of the range. How Do I Descale My Broysan Macerator? To clean a your Broysan you need to use a phosphoric acid based cleaner, bleach and other cleaners only freshen up a macerator pump. To descale your Broysan switch off the power, pour a minimum of 2.5 litres and a maximum of 5 litres down the toilet and leave to stand for 2-3 hours turn the power back on and then flush out with two full cisterns full of water to rinse the macerator out. For best results always use 5 litres 2-3 times per year. If you do not follow the instructions supplied then don’t expect the machine to perform in the way it was designed for, if installed correctly and used what it was designed for you can get many years of use from your machine 10 years or more depending on usage. We recommend having your Broysan Planus Macerator Serviced or cleaned out once a year or every 2 years to keep it running smoothly as they can accumulate a lot of grunge if used frequently and can start to smell like sewage after a few years. My Broysan Planus Macerator is Smelling. My Broysan Planus Macerator is Noisy. My Broysan Planus Macerator is Leaking. There are a number of reasons for this happening, if a macerator has a foreign object caught on the blade the pump cant spin fast enough to clear the waste water and can sometimes leak out of the air vent on the top of the Broysan Planus Macerator. 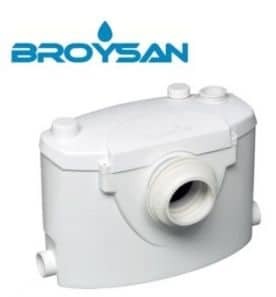 Another reason can be if the lid of the Broysan Planus Macerator has been removed in the past and not been put back properly water can leak out of the box while it is in operation. There could be a leak actually coming from the toilet, leaking on to the Broysan Planus Macerator and making it appear theres a fault with it. Get the machine inspected as soon as possible as water can cause substantial damage. If in London or Hertfordshire, call us for help. My Broysan Planus Macerator is Vibrating Shuddering Rattling. This is normally due to a foreign object being caught on the macerator blade and throwing the machine off balance whilst it is in operation, get the macerator repaired as soon as possible. If in London or Hertfordshire, call us for help. My Broysan Planus Macerator is Buzzing Humming. There are a few reasons for this, the capacitor has blown due to overloading, the motor is jammed by a foreign object or the motor is worn out and cant turn, if it’s one of the first two they can be repaired if the motor has failed you will need a new Broysan Planus Macerator. Get the machine inspected as soon as possible. If in London or Hertfordshire, call us for help. My Broysan Planus Macerator Box is Hot. This is caused by a jammed motor or a blown capacitor, switch off the machine as quickly as possible to prevent further damage and get the unit inspected as fast as possible. If in London or Hertfordshire, call us for help. My Electrics Keep Tripping Blowing Fusing. This is normally due to a worn motor and water getting in to it or you have loose wiring, get this inspected as soon as possible. If all the electrical connections are fine it’s most likely the motor is worn out another reason could be you have the wrong fuse, you will need a 13amp for older models and 5amp fuse for the newer models. If in London or Hertfordshire, call us for help. Water is Backing Up In My Shower or Bath. This can be caused by a Blocked Broysan Planus Macerator which needs cleaning, a blockage in the external waste pipe or a worn or jammed motor which is not turning fast enough to pump out the waste, get the machine inspected as soon as possible, this can be repaired. If in London or Hertfordshire, call us for help. My Broysan Planus Macerator Keeps Running Wont Switch Off. This could be due to a blockage in the waste pipe and the machine not clearing and because the Broysan Planus Macerator is full of water it wont switch off until it is empty or the switch and the membrane are defective and need changing, get this inspected as soon as possible switch the machine off, don’t leave it running as it will overheat and burn out, this can be repaired quite easily. If in London or Hertfordshire, call us for help. This could be due to water leaking in to the Broysan Planus Macerator from tap’s, water overflowing from a cistern or boiler or the most common problem is a defective membrane and switch this can be repaired quite easily or a leaking non return valve on the waste outlet. If in London or Hertfordshire, call us for help. This can be caused if it is being used as a kitchen pump and apart from pumping water out it will be having coffee, tea, food, waste water from a washing machine or dishwasher running through it, once all these items are combined after a few years the Broysan can give off a sewage smell, it can be cleaned out quite easily. If in London or Hertfordshire, call us for help. If you have not found a solution to your problem just send us an email and we will be glad to post a solution. If in London or Hertfordshire, call us for help. The new models of Broysan Planus Macerator are fairly quiet, if you were to have a shower or flush a toilet the noise made from flushing the toilet or the water coming out of a shower head would probably make more noise than the Broysan Planus Macerator. If in London or Hertfordshire, call us for help. The most common reason for this to happen is because on the lid the inlet pipe which is inserted in to the pump outlet has shrunk in diameter, this is because too much toilet cleaning chemicals have been used in the past. Another possible reason is that the Broysan Planus Macerator box is full of waste materials and not leaving enough room for water, the box would need removing and cleaned out by hand. This is most likely due to the waste pipe leading from the Broysan Planus Macerator being too small for the job. You need a minimum of 33mm waste pipe or inch and a quarter as it is known as. A larger diameter bore waste pipe will cure the problem. Another reason could be the switch and membrane are not working correctly by switching the Broysan Planus Macerator on too late then it will cause the macerator to overflow, call us for help.